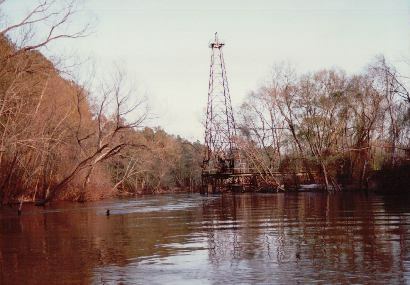 Rescue From the Sabine River. It was a Saturday in the summer of 1996. I had decided to ride my jet ski on the Sabine River. My put-in point was to be East of Carthage (Hwy 79) and I planned to ride the 11 miles to Longview (Tx 149). There was a weather forecast of thunderstorms in the afternoon, but being the hardhead that I am, I didn’t pay the advisory any attention. I left Shreveport and after a pleasant drive, I reached the highway 79 boat ramp and launched my machine about 1:30 PM. The trip to Longview was to be about an hour and a half. After reaching my destination, I took a brief break and refueled with extra gas I kept on board. I then headed back the way I came. I had only gone a few miles when I rounded a bend in the river and received a shock. There on the horizon was one of the blackest storm clouds I had ever seen. I said to myself I’d run full-throttle, but still, it would’ve been difficult to make it in the same time frame I had come down in. I figured I could travel through whatever was coming, but I was horribly wrong. The rain started slowly at first, and I put on a pair of googles. The drops just rolled off the lenses and I could see easily. But the rain increased and the wind picked up. My cheeks burned from the sting of the raindrops. The trees along the bank started swaying. I still didn’t think the situation was bad until I saw some broken tree limbs about the size of my forearm blow straight across the river. Frequent lightning was coming out of the thunderstorm to a degree I had never seen before and the almost-immediate thunder told me that the strikes were not all that distant. It was fast becoming a bad situation, but having made it to highway 59, I decided to press on. It was only about 20 more minutes to where my truck and trailer were parked. But when I reached a smaller ramp on FM 1794, I had had enough. It looked as if I was skiing into the open floodgates of a watery hell. I stopped and tied the jet ski to some bushes and assessed my situation. I was cold and wet with just my swimming trunks, a tee shirt and water shoes. I walked a few feet toward the highway when I remembered a twenty-dollar bill that I carried on the jet ski for emergencies. If this wasn’t an emergency, it would do until one came along. When I saw a black pickup truck parked at the top of the ramp, it almost seemed as though it was waiting for me. I was even more surprised to find out it was! The man had learned that it didn’t pay to respond to an “I-told-you-so speech, so he spoke to me. He said that despite the rain, there was a good chance that my jet ski wouldn’t be there when I got back to it. He then offered to sit there under the bridge (after removing a six-pack of beer from a cooler) and keep an eye on things until I got back. His wife drove me the remaining thirteen miles to my truck while the boys absorbed the situation – not quite sure of why this wet stranger was dripping all over the seat of their dad’s truck. The gas gauge was near empty so we stopped at a convenience store and I spent the wet twenty on gas. The clerk accepted it and hung it up to dry with a clothespin she may have kept there for similar situations. This was, after all, East Texas were practicality and preparedness are valued virtues. After picking up my truck and trailer and returning to the young man, I took out my billfold from my truck and gave him a very dry twenty dollar bill, thanking him and his wife for their kindness and his wife’s keen eye for stranded river rats. I had these peoples names and address for many years but sadly, it was lost somewhere along the way. I do know that they lived nearby Carthage, however, and I never pass that stretch of road that I don’t remember the event and their kindness to a cold and wet stranger who has since learned to acknowledge weather reports.